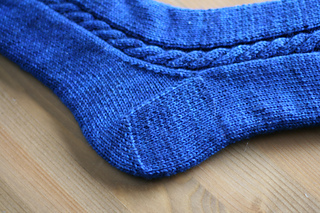 To Fit US size 9 womens foot, however this sock is easy to resize. 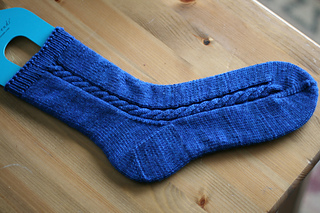 The design of this sock was my solution to toe-up sock heels that didn’t fit my foot, or created too many holes. The top-down-toe-up sock is a heel flap sock, but instead of the heel flap being on the back of your heel, it’ll be on the bottom of it! This sock is a great way to use all of the yardage in your ball of yarn! There will be two cables, one running down the lateral sides of your foot. An easy taster if you’re new to cables! Rachel of the Knitcents podcast and I designed joint patterns using this construction. Check out her version here!